This page provides best estimates, at the time of the Call for Proposals, of instrument availability and target (RA, dec) restrictions for 2014B. At each Gemini telescope, instruments are mounted at the Cassegrain focus on the instrument support structure (ISS). A science fold mirror mounted inside the ISS can be rotated to send the light from the telescope to any of four side-looking ports, or can be retracted so that the light goes to the up-looking port. At each site, the calibration unit and the Adaptive Optics system use two of the side ports, leaving two side-looking and one uplooking port for other instrumentation. As more than three instruments are offered each semester, instrument swaps will be required and not all instruments will be available for the entire semester. Instrument swaps will be driven by demand and scheduled to minimize impact on the queue. Certain targets or entire programs may not be feasible once the final schedule is determined, at ITAC or thereafter. If an instrument is requested for less than 6% of the Bands 1+2 time, the Observatory reserves the right to limit the RA range available to programs, or to not schedule the instrument. Changes to the instrument mounting are not permitted during classical runs. GNIRS will only be available from October 6 through the remainder of the semester, after engineering work on the instrument has been completed. Targets are therefore limited to RA 21h to 13.5h. DSSI Speckle Camera will be available for up to 100 hours, subject to demand, from 17-27 July, 2014; targets are therefore limited to RA 15h to 1h. TEXES will be available for up to 100 hours, subject to demand, from 7-17 August, 2014; targets are therefore limited to RA 16h to 3h. The Laser Guide Star (LGS) system must be used at or above 40 degrees elevation. How this translates into RA and dec restrictions is indicated in the Table. Owing to additional commissioning work at the start of the 2014B semester, targets for GPI are limited to RAs from 19h to 11h. For nominal performance, GPI targets are restricted to a maximum zenith distance of 40 degrees, translated into dec restrictions in the Table below. 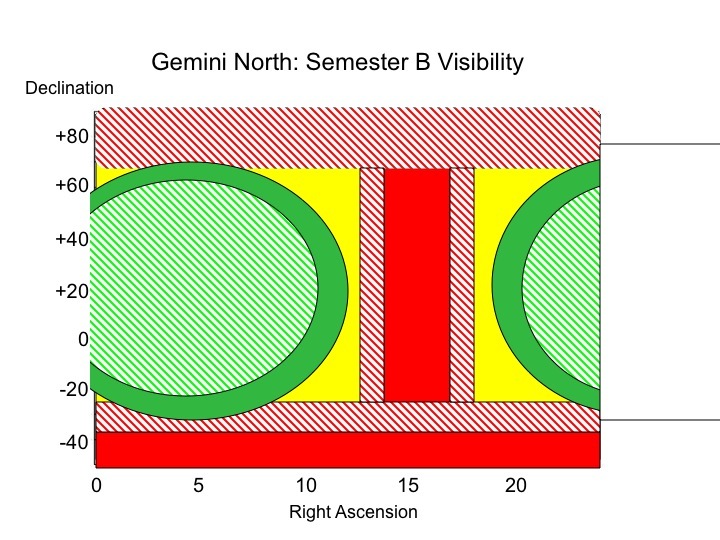 Figure 1: Schematic representation of target accessibility at Gemini North during semester 2014B. Green regions offer unrestricted access, red regions are inaccessible. Hatched areas indicate the more restricted LGS regions. The yellow region is possible, but restricted. See text, and values in the Gemini North Table above. 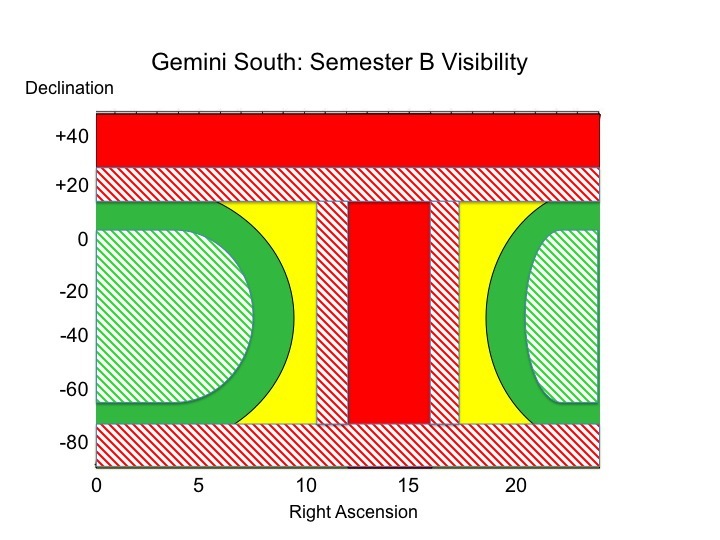 Figure 2: Schematic representation of target accessibility at Gemini South during semester 2014B. Green regions offer unrestricted access, red regions are inaccessible. Hatched areas indicate the more restricted GeMS regions. The yellow region is possible, but restricted. See text, and values in the Gemini South Table above.